Over the holidays I had the opportunity to watch Ostrov yet again (Russian film portraying Orthodox spirituality). Afterwards my husband and I both commented on how the more we watch it, the more we get it. What I love the most are the prayers: the Jesus Prayer, Psalm 50, the Trisagion, the opening of Divine Liturgy... When I hear those oh-so-familiar words, I have a strong sense of home and peace whether it is being prayed in Russian, English, in my own parish, in a church in a different country (or even jurisdiction :) ), or in a film. I jotted down some of the thoughts about it that have been floating around in my mind and thought I'd type 'em up--no particular agenda or message to this post. Mostly factoids. Probably will use bullet points, even. Whether or not you've seen the movie, this probably will seem quite random. Not sure if I'd call these spoilers, but I guess if you like to experience movies like this without any expectations or preconceived thoughts, you may not want to read this. I really noticed this time how there is no indication of disbelief or surprise when the monks find out that Fr Anatoly is preparing to depart this life and that he knows the exact day. Those who live holy lives of prayer more expect miracles and this sort of thing than they are surprised by them. They have a clearer understanding of reality and of what is the norm. The Orthodox approach to death is one of the things which will change me the most over time, I think. The balance of sober reality and peace is really beautiful, and I appreciate how it is portrayed in this film. As a fool for Christ, Fr Anatoly disguises his greatness (God's grace) before others so as to avoid praise and elevation in rank. When his strange ways are judged, he only defends himself with Scripture--that really stuck out to me this time. Although he is simply following Christ's example with his responses, at first glance it looks like just another example of odd behavior. But he has truly become a stranger to this world, and he does not seek any justification from man. 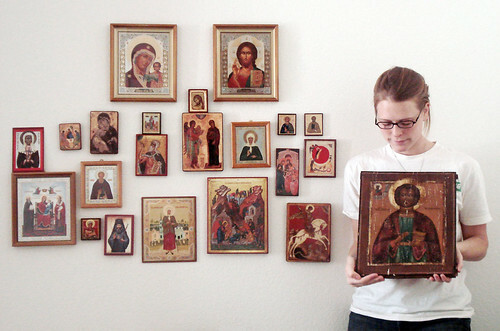 This was the first time it sunk in that the cozy room where Fr Anatoly prays (keeps his icon) is his cell where he's supposed to sleep. However, he chooses to sleep on the rough coals without any bedding. Before, I recognized it as an aesthetic effort of depriving himself of unnecessary comforts. This time I see it as him keeping his sins continually before himself in order to stay in a constant state of repentence. He labors over the coal (symbol of his sin) during the day, sleeps on it at night, and suffers with it in his lungs. Because of his life of repentence and humility, God grants him the gift of tears, prayer of the heart, healing, and of clairvoyance. I think the abbot Filaret is a great character. He seems peace-loving and unobtrusive. He sees Fr Anatoly's holiness and has the difficult job of reconciling (before the other monks) Fr Anatoly's unusual ways with the order of the monastery. I also notice that he does not seem intimidated by the fact that Fr Anatoly, a simple monk whom he probably helped to save, has apparently achieved a higher level of holiness than himself, the abbot. Also, during the movie his quiet demeanor is contrasted with a firey, obnoxious confrontation of his sin. As an observer it is easy to judge his character for being so attached to fine boots and linens, being an abbot and all. However, in "reality" (being that he's fictional), he lives in the harsh conditions of northern Russia on an island and takes comfort in a couple worldly things which he didn't even buy for himself. Those are small potatoes compared to my worldly appetite for comfort and fine things! What is most important is that he readily humbles himself, takes the correction and is thankful for it. Frs Job and Filaret are convicted of their own downfalls just by interacting with Fr Anatoly in his regular day-to-day life. His virtues exaggerate their sins. Him sleeping on coals and doing such hard labor in his poor health is in stark contrast to the abbot's beloved luxuries. His humility and prostrations for forgiveness before Job frustrate Job all the more because he is not willing to let go of his pride. It is interesting how true that is to reality. Lastly, it always strikes me how people come to Fr Anatoly looking for advise, prayer and miracles, but then are unwilling to accept all that is offered to them. They thought they knew what they wanted... The mother brought her son for physical healing, but did not care as much for his spiritual healing although that is the whole point of life and therefore of God's dealings with us. If you haven't seen Ostrov yet, I highly recommend it. I have to admit (and warn you) that the subtitles are subpar for sure. But I have heard enough great reviews from English-only speakers to have hope that it can make some sense anyway. St Nicholas of Myra...the feast approaches! Commemorated December 6 (19, OC). "For I testify unto every man that heareth the words of the prophesy of this book, If any man shall add unto these things, God shall add unto him the plagues that are written in this book. And if any man shall take away from the words of the book of this prophesy, God shall take away his part out of the book of life, and out of the holy city and from the things which are written in this book." Advocates of sola scriptura heavily rely on this passage: to them "the book" mentioned is the complete, Old and New Testament Bible--the complete canon. However, the book in question is plainly "this prophesy" of St John and not the entire New Testament canon (which did not exist at the time). In fact, the book of Revelation almost didn't make it into the final New Testament canon. Nowhere in Scripture does it say that ALL the important doctrines and traditions that Christians are to follow are spelled out in the letters written by the apostles to the churches (esp in those specific ones that made it into the complete canon). And nowhere does it say that any practice not specifically spelled out in the Scriptures is to be rejected (unless Rev 22;18-19 is misinterpreted). One must presuppose sola scriptura to be true in order to interpret the passage to be referring to the complete canon of the Bible as we know it today. I have been reading the 17th Kathisma of the Psalter for my departed Grandmother and am interested to learn the specific reasons why this particular Kathisma was chosen. As I, a sinner, read it, it really does seem to turn into a prayer of compunction followed with the hope that someday, somehow I will be able to pray Prophet David's words from a pure heart. Please share if you have learned anything about it or find anything! Let me explain where my previous, somewhat random post came from. The other night I was just reading through my journal and came across this short quote from one of Matthew Gallatin's podcasts. In this particular podcast he described how experiencing or walking with God can be compared to dancing with a partner. The question I posed on my last post is actually the question he had asked himself while still a western Christian: "If I ignore what I believe about my God and set aside everything that I feel about my God, what is left of my experience with God? And the answer was nothing." This felt relevant to where I've been spiritually lately. I also posted it as kind of a poll because I was curious to hear what it would bring to mind for others. When I first heard Gallatin's question, it really hit home for me as I could totally relate to his question and his answer. In the times when I was unsure what belief was right and when I came down from spiritual highs, where did God go? How could I lose Him so easily and frequently? If we say that God can only be experienced through beliefs and feelings, are we not saying that He only exists in relation to our minds and "hearts"? (I say "heart" because feelings originate in the mind, our true heart is our nous.) Our relationship with God must include more than theology and 'lofty' thoughts and feelings. I believe that God, especially in Christ's incarnation, is concrete and can be experienced in very concrete ways. He is here, everywhere present and filling all things. I mentioned that the whole reason I chose this quote is that it is relevant to where I've been spiritually lately. You see, I've noticed how, yet again, I've been turning off course in my spiritual life. I have been thinking plenty, my beliefs are as strong as ever, and I have even felt spiritually sentimental, but still these days I find that I am lacking a true experience with God. I see it in my behavior, in my internal life and in my relationships. The reason for the lack is that I have not been actively, intentionally participating in the life of God through the Holy Mysteries. It is through the Mysteries (there are more than seven, by the way) that we encounter God, and His powerful Presence changes us and makes us a little more like Him. Although these experiences rarely bring tears to my eyes nor am I usually filled with palpable joy, they are real and leave an impression on my soul, mind and body. Many people who are not part of the Orthodox faith still think that the Divine Mysteries (Sacraments) are evidence of a works-based salvation theology, but that is a misunderstanding. A life of holiness and participation in the Holy Mysteries are how we meet God in a concrete way and are thereby purified. Orthodox Christians follow this way to holiness so that we, His unprofitable servants, can, through God's great mercy, be fully united with Him in the end. Glory to God for all things. I welcome comments, corrections, additions. If you ignore what you believe about your God and set everything aside that you feel about your God, what is left of your experience with Him?